Overnight Parking Permission: **PLEASE READ THE FOLLOWING PRIOR TO SUBMITTING YOUR REQUEST** Each parking request requires a valid license plate number and MUST be submitted prior to 2:00 AM of the first day requested. Parking permission is limited to four (4) consecutive days and a maximum of ten (10) separate requests per year. 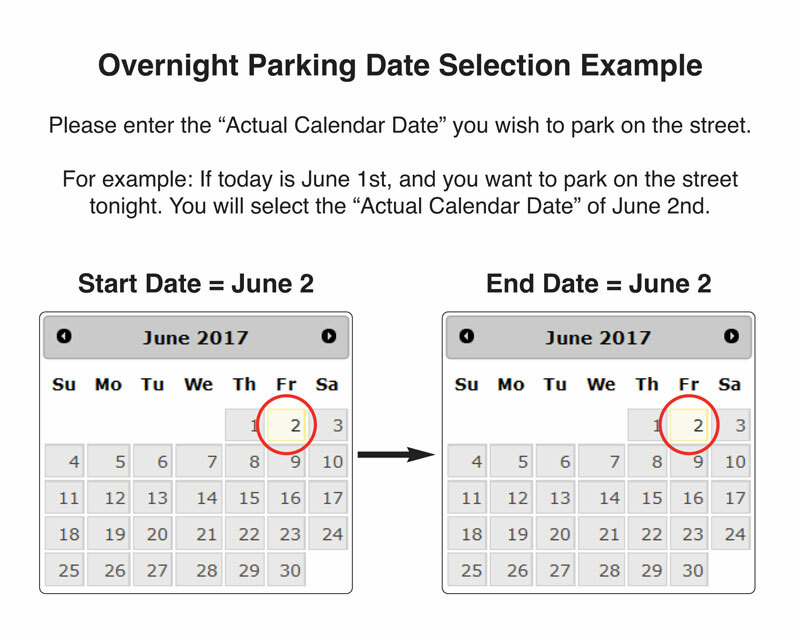 All vehicles receiving overnight parking permission must otherwise be parked legally (i.e., not in violation of posted signs, fire hydrants, wrong direction, private property, prohibited zones, etc.). All parking requests are subject to snow ban restrictions and you may still receive a parking citation during a snow ban regardless of whether you have entered a parking permission.